Where will you be glamping next? AfriCamps provides luxury self-catering tented accommodation on 8 of the finest farms and estates in South Africa. We have scouted the country far and wide to bring you 8 unique glamping camps, each offering something special. Whether you’re after the rolling green hills of indigenous forests, the peaceful meander of SA’s rivers, the arid beauty of the Karoo, endless fun for the kids or a romantic escape, we know you’ll find your favourite. 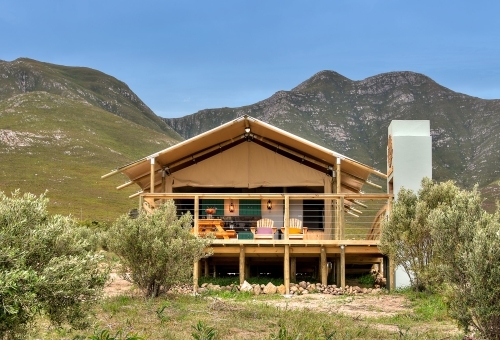 The Cape Winelands’ first-ever glamping camp can be found beneath the historic Bainskloof Pass set within the award-winning Doolhof Wine Estate. 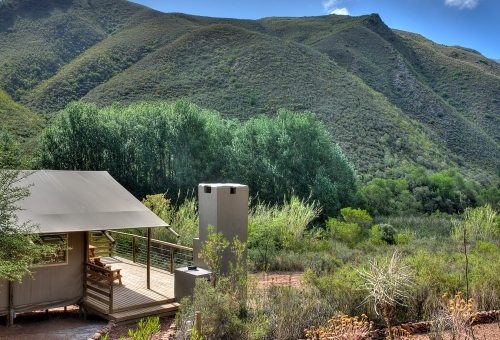 Six tents are surrounded by beautiful vineyards, the peaceful Kromme River and the majestic Groenberg Mountains. 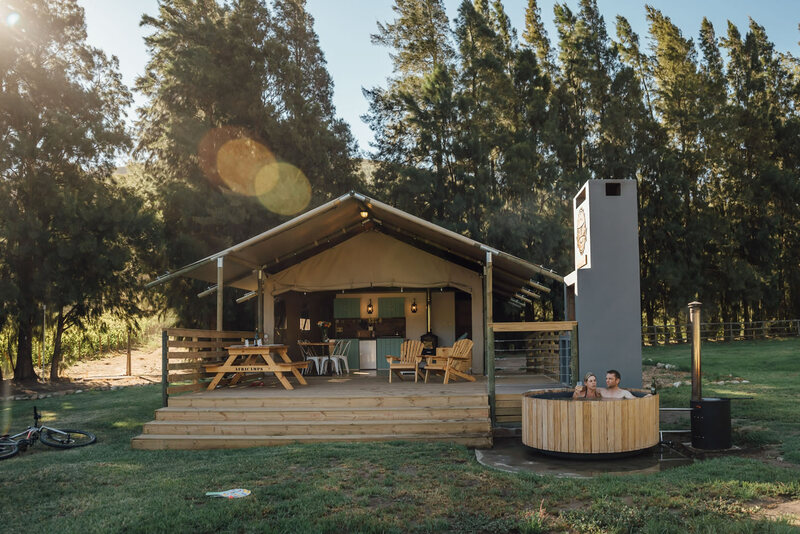 Soak up the views from the outdoor wood-fired hot tub next to your tent or explore the farm’s vineyard hike, river walk, MTB trails and wine tasting room. Experience a working dairy farm where cows are milked and calves fed daily, explore the farm on horseback or by mountain bike, hike to the farm’s own waterfall, try a spot of fishing or take out the canoe on one of the farm dams. 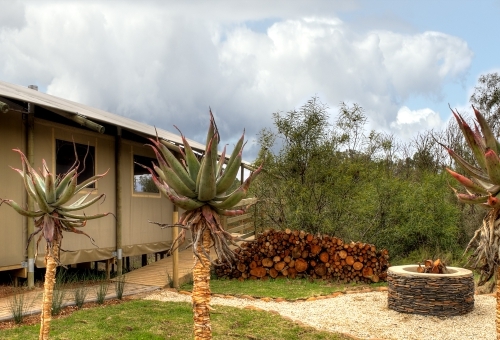 Located in the heart of the Garden Route, AfriCamps at Oakhurst is close to all of Wilderness’ adventures and stunning beaches. An amazing glamping location from where to go on safari in the Kruger National Park, Sabi Sands Game Reserve or explore the Panorama Route. 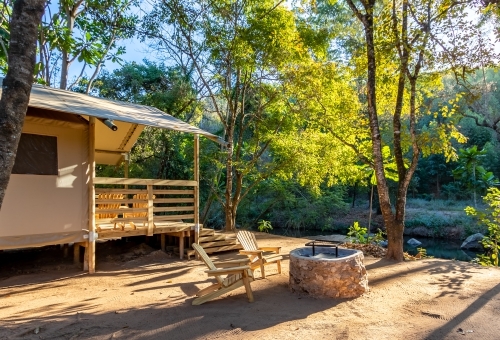 Visit Mpumalanga’s highlights from AfriCamps at Mackers in Hazyview, where your tent faces the tranquil Sabie River. Located in The Crags, AfriCamps at Ingwe shows off with beautiful foresty views over rolling green hills. 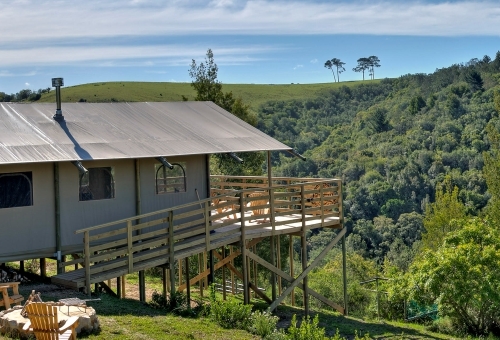 Here you can enjoy the views from a private outdoor wood-fired hot tub, take walks in the forest, view the fallow deer, impala and dairy cows and enjoy the numerous adventures of the Garden Route. 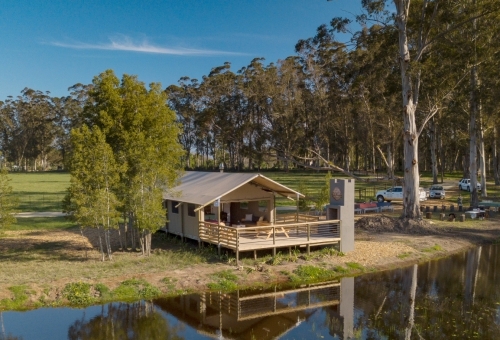 Located on one of Stanford’s leading wine and protea flower farms where glamping meets a hearty food experience. Stanford Hills Wine Estate’s restaurant has a new lunch menu daily and a tasting room for the wine lovers. Take walks (with your dog) on the farm among the abundantly growing proteas or explore the beautiful coastline of Hermanus. Here you are surrounded by 2000ha of mountain fynbos, streams and farm dams. The most romantic destination if you want to get away from the hustle and bustle of everyday life. Explore the longest wine route in the world – the Route 62, spot 100+ different bird species and wander off on several hiking and mountain biking trails. The perfect destination for families with young children. Here you will find water slides, a putt-putt course, and loads of fun on the river. The kids love jumping into the river from a rope swing and biking through the camp for hours. 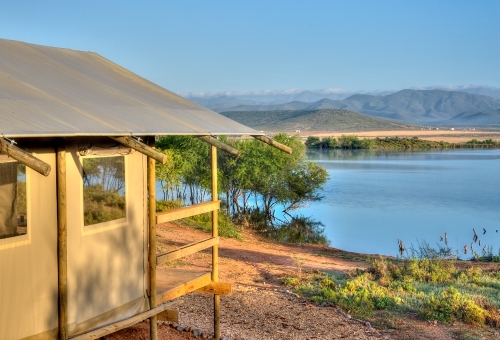 Take out a canoe and row up and down the Breede River spotting birds or fishing. This location takes you to the heart of the Cape Klein Karoo where guests will enjoy the peace, quiet and uniqueness of the area. Named after the Khoisan word ‘Land of thirst’, it is a dry and arid area, but this brings a unique beauty popular among travellers. Take a scenic Karoo drive, a working ostrich farm tour and relax by spotting game or star-gazing from your own deck.